An application that could prevent thousands of catheter-associated infections in hospital patients might also be used in cutting boards, baby bottles, and doorknobs to resist harmful bacteria. In this episode of Mastering Innovation on SiriusXM Channel 132, Business Radio Powered by The Wharton School, University of Pennsylvania students Tanvi Kapur (W’19), Ishir Seth (C’20,W’20), and WenTao Zhang (C’19,W’19) discuss furthering their idea to use roll-to-roll surface wrinkle printing to create material for urinary catheters that would prevent biofilm formation and stop bacterial infections. 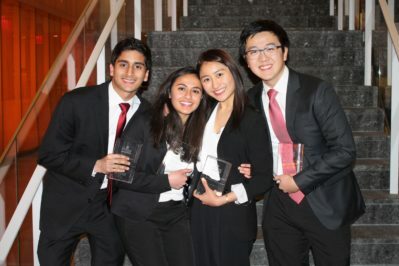 The group won the 2019 Y-Prize for their plan, and now they’re looking ahead to testing and the patent process. By focusing on proof of concept, the team hopes to better understand the efficacy of the technology application and ensure that it can deliver the results seen in laboratory studies. Meanwhile, they’re open to advice from venture capitalists, medical professionals, professors, and fellow students. Harbir Singh: What are the next steps in terms of scaling this venture besides production? Tanvi Kapur: Our next steps are all testing related. Our current plans right now are to sign the option to research with Penn Center for Innovation, which basically gives us the option to test the technology right now. So we’ll be using it, we will be looking at different sizes and shapes of wrinkles, testing whether bacteria does or does not grow on them, looking at different chemical applications on top of the plastic, and then from there looking forward, two of our teammates are going to be here over the next year being able to work on this. So after we do Petri dish testing, moving into animal testing, seeing what are the applications of this in animals, and then finally in a year or so moving into clinical trial testing if possible. Singh: Were you going to do something in the area of other applications? You were just talking about things beyond this coating, right? What are the other applications that might be present? WenTao Zhang: Other applications that we’ve looked into beyond medical devices are other antimicrobial applications. For example, we see that in hospitals in general, nosocomial infections, which are infections that you acquire through the hospital are a humongous problem. We’re looking at potential doorknob coating for surgery rooms, in order to mitigate the bacteria that could potentially adhere to these surfaces. We’re also thinking about other food applications, so potentially use it on cutting boards or in food processing plants to reduce the chance of biofilm formation. Ishir Seth: And the scalability of this technology is really impressive. One of the really interesting applications is coating the bottom of ships and preventing barnacles from attaching. And it’s interesting to see how a technology that can be applied in hospitals can also be applied to coat ships and help improve their fuel efficiency, help reduce wear and tear. It shows that bacteria and biofilms are really impacting us in so many different ways. And we’re really excited to see where we can apply our technology next and how we can impact different aspects of our life. Singh: How do you prioritize the applications then? The first is the catheter, right, which you already are working on. Are you going to then think about defining the IP and making sure that the intellectual property is something that you can capitalize on and then get into other applications? Kapur: Yeah, that’s definitely what we were focusing on now. It’s definitely important that we figure out whether the IP is focusing on the broader manufacturing, whether it’s focusing on specific use cases of catheters. So it’s important that we define that now, then move on to the PCA research and then from there go on to broader applications. But it’s important to get advice from others. So after the Y-Prize, we got the advice that we should first be looking at baby bottles, for example. One of the VCs was telling us that he thinks it’s a huge market. It’s something that we should move into. And so I think it’s important for us to get advice from all of the people that have been supporting us and then move forward. Singh: If you look at the next 12 months, what are the main mileage markers you have, time markers that you have on this? Zhang: Over the next 12 months, I think the first thing that we have to do from the science side is doing proof of concept testing in preclinical bacteria models. So to validate the efficacy as well as the scalability of the manufacturing process by doing these bacteria testing. On the patenting strategy side, as Tanvi mentioned earlier, we’re going to sign the options, the research agreement, with the Penn tech transfer office, in order to have access to testing out this technology. And from the commercialization side, we’re also going to be exploring other commercial opportunities that may not require as stringent regulatory approval as medical devices. So for example, the baby bottles, as well as the doorknob coating that we were considering. Seth: In the very short term, we’re actually really excited to present at the Wharton startup competition in May. So we’re preparing for that. We’re looking for other funding opportunities on campus through different Penn resources that can really help us drive our project forward and help fund our early tests. Singh: When you think about what is the end game here, what would success look like? You already have success. What would a great success look like? There are different ways of thinking about it, right? You could think about great success in terms of commercialization and wide application. You could also think about success in terms of intellectual property that has been used elsewhere. So have you thought about that? And what do you prioritize higher so that you’re not stretched too thin with lots of different goals? Zhang: Yeah, absolutely. And I think the application that we pitched, which was for urinary catheters, carries great significance for us. So, especially given the large impact that we can have by redesigning the urinary catheter and helping improve a lot of people’s lives, I think that’s something that is still going to be our main focus. So with respect to definition of success, I think perhaps four or five years down the road, we hope to have at least started phase one approval with the FDA regulatory approval for our product. And whether or not we build this into a full company or hopefully potentially get acquired by another medical devices company or licensed, those would all be our definitions of success. Getting it out to the broader market. Singh: When you speak to venture capitalists or accelerators, people who try to accelerate a business, what is the advice you’re getting in that domain? Zhang: Yeah, so I think a lot of venture capitalists that we’ve been speaking to have specific focuses in life sciences as well as in medical devices. And the overarching comment that we’re getting is that in order for our technology to work, we obviously need to focus more on the sciences to better understand the efficacy of the technology. We have a very strong emphasis on the rigor of our scientific testing to make sure that our technology is fully rigorous and it can deliver the results that we’ve seen so far in our laboratory studies. Singh: So it’s the scientific progress that you’re focusing on first. Very interesting. Have you thought about monetizing intellectual property and how you might go about doing that? Kapur: So right now, our focus is not on that, maybe in the longer term that is our focus. Right now our focus is to talk to as many surgeons, physicians as possible to make sure that this is exactly the application that we need, that we will be able to save lives using this technology. And then to do the rigorous testing using the research option and then figuring out how to monetize the patent. Tanvi Kapur (W’19) is a senior at the University of Pennsylvania studying Operations and Entrepreneurship. She is originally from Frankfurt, Germany, and Thousand Oaks, California. WenTao Zhang (C’19,W’19) is a senior at the University of Pennsylvania in the Roy and Diana Vagelos Program in Life Sciences & Management pursuing dual degrees in Finance and Health Care Management in the Wharton School and Biology in the College of Arts and Sciences. He’s involved with the Wharton Small Business Development Center and Nosoco Technologies, a medical devices startup he co-founded. Ishir Seth (C’20,W’20) is a junior pursuing a B.A. in Biology with a concentration in Mechanisms of Disease and a B.S. in Economics with concentrations in Finance and Health Care Management through the dual-degree Roy and Diana Vagelos Program in Life Sciences & Management. Deeply passionate about the intersection of health care and business, Seth is president of the Penn Undergraduate Biotech Society, a growth consultant at the Wharton Small Business Development Center, and a research assistant at the University of Pennsylvania Perelman School of Medicine Center for Cellular Immunotherapies.